An 80-year-old man presented to the University of Iowa Department of Ophthalmology for three weeks of painless, acute vision loss in his right eye (OD). He had been seen locally and was diagnosed with a central retinal vein occlusion (CRVO). On review of systems, he had occasional palpitations secondary to atrial fibrillation for which he was on warfarin and aspirin. He denied weight loss, fatigue, anorexia, chest pain, shortness of breath, mouth ulcers, fevers, nausea, or vomiting. He had been treated for early primary open angle glaucoma (POAG) for seventeen years and was taking latanoprost every night at bedtime in both eyes (OU) and timolol every morning OU for many years with stable visual fields OU. Figure 1. Color fundus photography, both eyes: There were numerous dot-blot heme and flame hemorrhages throughout the macula and mid-periphery of the right eye (left image). The left eye (right image) demonstrated a large cup-to-disc ratio but no other retinal abnormalities. Figure 2. Fundus fluorescein angiography, right eye: There was evidence of delayed arteriolar filling (top left) with diffuse, late leakage in the macula (bottom images). In these images, it was difficult to evaluate capillary non-perfusion as there was blocking by the numerous retinal hemorrhages. Figure 3. Goldmann visual fields (GVF), both eyes: OD- There was a constriction of the I2e isopter and a nasal step of the I4e isopter. Otherwise, the fields were full to the V4e isopter with no scotomas. OS- There was mild nasal constriction of the V4e, III4e, and I4e isopters, severe constriction of the I2e to ~2 degrees, and a paracentral scotoma to the III4e isopter. Figure 4. 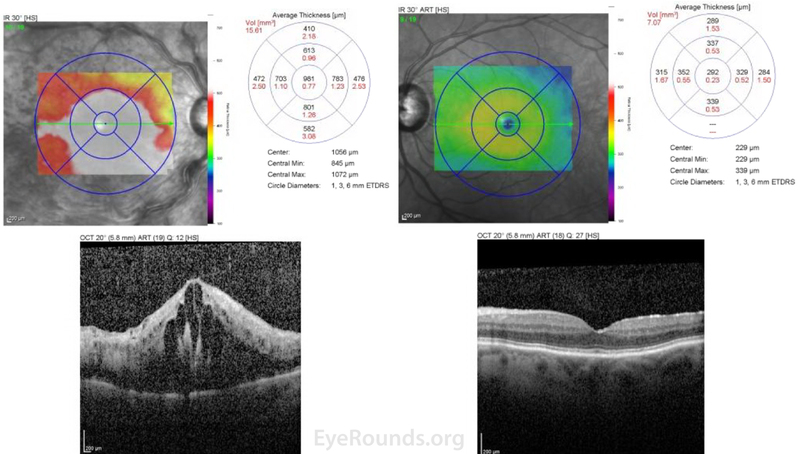 Optical coherence tomography (OCT), both eyes: OD - Severe cystoid macula edema (CME) with a central macula thickness of 981 microns. OS - Normal foveal contour with mild epiretinal membrane. On initial presentation, the patient was diagnosed with a CRVO OD with massive CME OD. 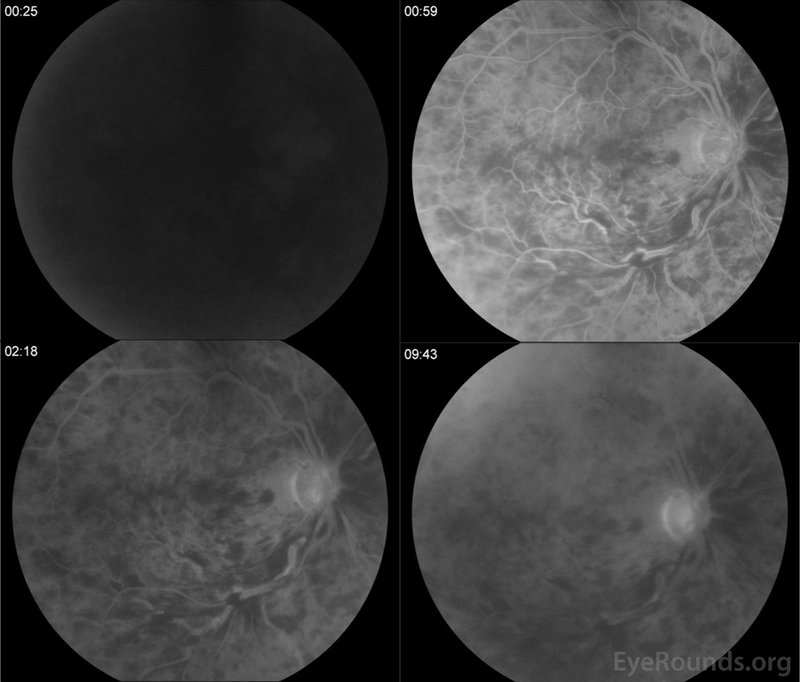 The patient's RAPD and profound vision loss with significantly delayed arteriovenous transit time on fluorescein angiography suggested the patient had an ischemic CRVO. He received a 1.25 mg intravitreal injection of bevacizumab. He had no improvement in vision with monthly bevacizumab injections. 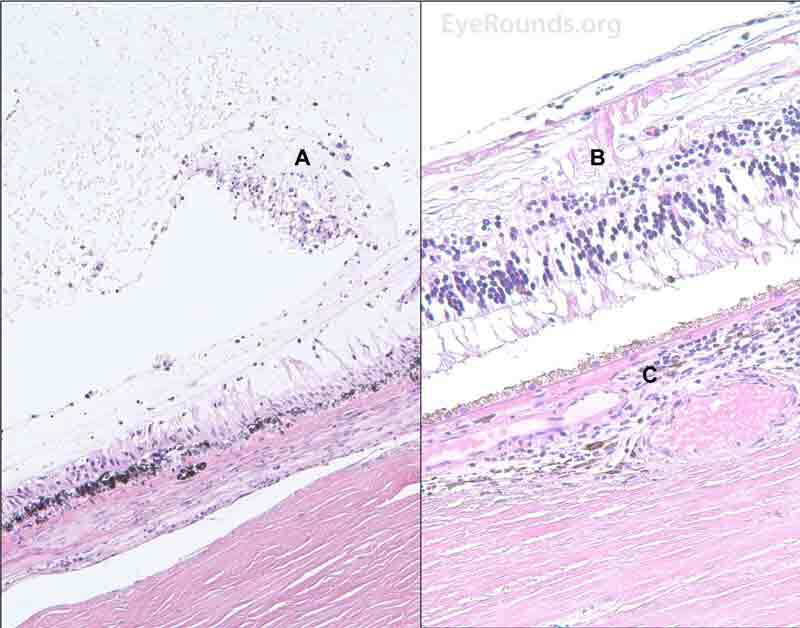 At his three-month follow-up, he was noted to have 360 degrees of neovascularization of the iris (NVI) most prominently seen at the pupillary margin. However, his IOP was normal and he had no neovascularization of the angle (NVA) on gonioscopy. At that time, he underwent two sessions of panretinal photocoagulation (PRP). He remained stable for two years receiving only two additional bevacizumab injections for CME. He presented two years after the initial CRVO OD with a marked decrease in vision to hand motion (HM) OD immediately after shoveling. On exam, he was noted to have an NVI-related hyphema (Figure 5) and a moderately dense vitreous hemorrhage (VH) (Figure 6). He received a bevacizumab injection and was seen monthly with several additional sessions of PRP for fill-in treatment OD once the VH cleared. Despite the additional PRP, he had two additional episodes of VH over the next year and eventually developed new temporal NVA. 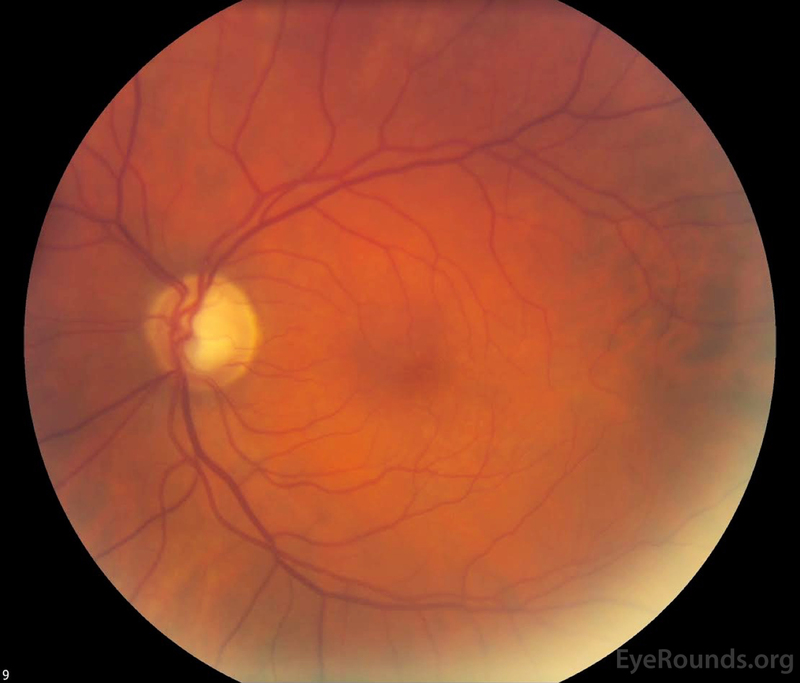 His IOP OD increased to 48 mmHg, and he reported several episodes of severe eye pain. He received bevacizumab every 6 weeks and was started on maximum topical therapy for neovascular glaucoma (NVG). Cyclophotocoagulation (CPC) was then performed. However, given the patient's poor visual prognosis and persistent pain, the patient decided to undergo enucleation of his painful, blind eye approximately five years after his initial CRVO. Figure 5. Slit lamp photography, right eye: There was 2+ diffuse injection that was worse at the limbus. The cornea was clear superiorly. A 4 mm hyphema was present with residual neovascularization of the iris along the pupillary margin. Figure 6. Standardized ocular echography, right eye: Moderate vitreous opacities seen consistent with dense vitreous hemorrhage. No retinal detachment or mass lesion was visualized. The patient's right eye was processed, sectioned, and stained in the University of Iowa Ocular Pathology Laboratory by Dr. Nasreen Syed. The pathological changes identified were consistent with severe NVG in the setting of retinal ischemia from a prior CRVO. These changes included endothelial cell loss and secondary stromal edema, broad anterior synechiae with flattening of the anterior chamber, and iris and iridocorneal angle neovascularization resulting in angle closure (Figure 7). There was ciliary body ablation (Figure 8) with necrotic cyclitic membrane formation (Figure 7F and 8). Abnormal blood vessels were seen histologically on the surface of the iris in an irregular and non-radial pattern (Figure 7E). Evaluation of the posterior chamber showed an old VH, retinal atrophy and neovascularization, macular subretinal neovascularization, CME, and chronic choroiditis (Figure 9). There was also severe optic nerve atrophy with focal infiltration of lymphocytes in the nerve posterior to the lamina cribrosa and an gliotic membrane over the surface of the disc (Figure 10). 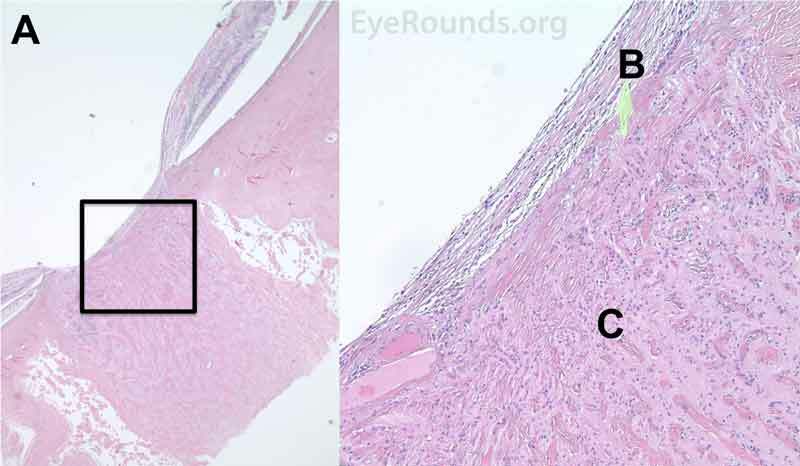 Peripheral chorioretinal adhesions were present in the retinal periphery consistent with laser scars; there was hyperplasia of the retinal pigment epithelium in many of these areas. 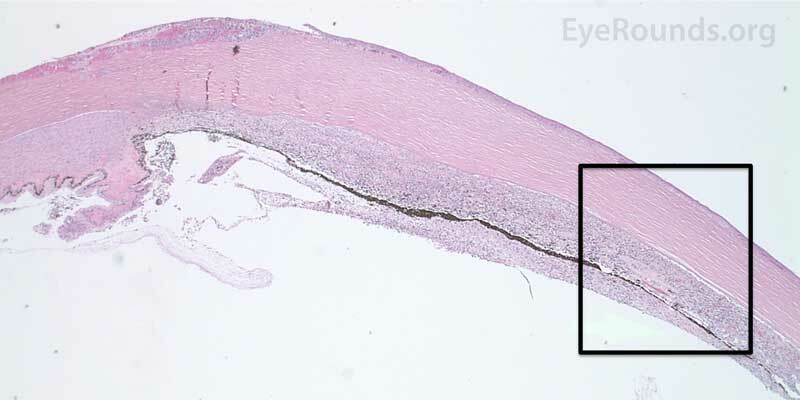 The macular region demonstrated cystoid edema in the outer plexiform region, and there was a subretinal neovascular membrane present in the macular region with significant sclerosis. Figure 7. Pathological changes of the cornea and iris in NVG. A- There is a glassy appearance of the cytoplasm of the corneal epithelium suggestive of hydropic degeneration. B- The corneal stroma demonstrates diffuse loss of artifactitious clefting and central significant loss of keratocytes. C- The anterior chamber was flat, and the iris was adherent to the posterior surface of Descemet's membrane, replacing endothelial cells. D- There is severe endothelial cell loss with secondary stromal edema. E- The iris demonstrates florid neovascularization and a moderate infiltrate of lymphocytes and plasma cells. F- There is a necrotic cyclitic membrane present posterior to the iris. 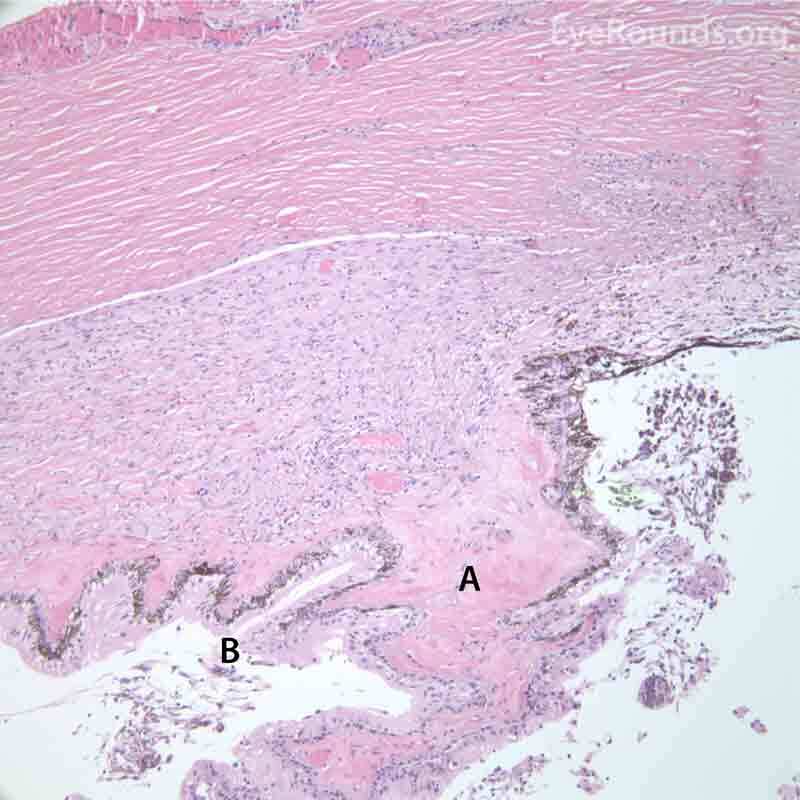 The upper hematoxylin and eosin (H&E) image (10X) shows the location (black box) of the lower image (40X). Figure 8. Pathological changes of the ciliary body in NVG. 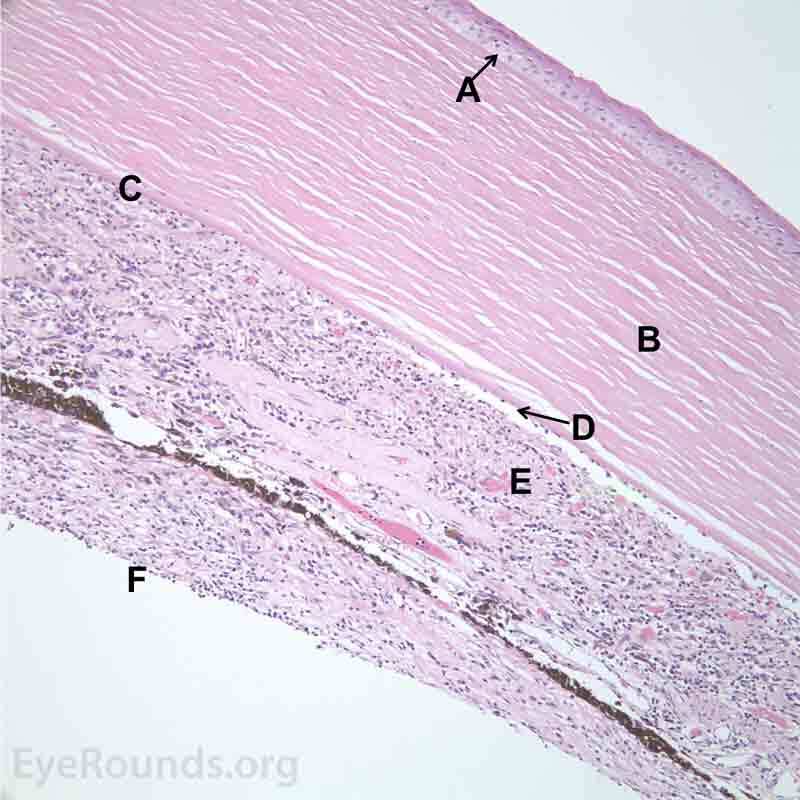 A- The ciliary body is atrophic with evidence of ciliary ablation and muscle necrosis. The ciliary processes in the pars plicata are coalesced in some areas. B- The surface is covered with a collagenous membrane that demonstrated some necrotic material and old red blood cells. The upper H&E image (10X) shows the location (black box) of the lower image (40X). Figure 9. Pathological changes of the vitreous and retina in NVG secondary to an ischemic central retinal vein occlusion. Left H&E image (20X): A- The vitreous cavity demonstrates an anterior fibrillary membrane with old red blood cells and occasional macrophages. Right H&E image (40X): B- The neurosensory retina demonstrates a neovascular membrane in the periphery. The neurosensory retina also demonstrates diffuse loss of cellularity in the inner layers including the ganglion cell layer and the inner nuclear layer. Some gliosis is present in the nerve fiber layer. C- There is a patchy, moderately dense infiltrate of lymphocytes in the choroid. Figure 10. Pathological changes in glaucomatous optic neuropathy secondary to NVG. A- The optic nerve demonstrates severe atrophy and mild gliosis. B- An epiretinal membrane consisting of fibrous appearing cells is present surrounding the disc and over the surface of the disc. C- There is a focal infiltrate of lymphocytes present in the nerve posterior to the lamina cribrosa. The left H&E image (10X) shows the location (black box) of the right image (40X). NVG is a common and very severe type of secondary angle closure glaucoma (ACG) that develops in the setting of retinal ischemia resulting in aqueous vascular endothelial growth factor (VEGF) and NVI. This entity is clinically diagnosed and divided into four unique stages via anterior biomicroscopy and gonioscopy: prerubeosis, preglaucoma, open angle glaucoma, and ACG. Later stages are characterized by remarkably high IOP, and visual prognosis is poor. Other imaging modalities that are not necessary but often useful include ERG, intravenous fluorescein angiography, OCT, GVF testing, and B-scan ultrasound. The treatment of NVG is not only aimed at reducing IOP via medical management and surgery but also directed towards inhibiting the underlying mechanism for the development of NVG via PRP and anti-VEGF intravitreal injections. The incidence of NVG has been shown to be mildly higher in men . The disease occurs more frequently with age and occurs during the sixth and seventh decades of life in 46% of patients . NVG is most commonly associated with ischemic CRVO . The Central Vein Occlusion Study (CVOS) reported that 28% of cases with NVI, or rubeosis iridis, occurred in the setting of ischemic CRVO . Approximately 49% of ischemic CRVO patients develop NVI within 6 months, and ~45% of this patient population develop NVG over four years [2, 4]. In patients with diabetes, onset of NVG is usually correlated with glucose control. Among all diabetics, approximately 2% develop NVG, whereas the prevalence increases to 21% in the setting of proliferative diabetic retinopathy (PDR). NVI can be identified in 64% of PDR patients . The Diabetes Control Complications Trial (DCCT) noted a 24% incidence of NVG over 9 years amongst the standard treatment group compared to 8% in the intensively treated group . The retina has the highest oxygen consumption in the body and is, therefore, vulnerable to ischemia . NVG results from retinal ischemia secondary to ischemic CRVO, PDR, or ocular ischemic syndrome (OIS) in 36%, 32%, and 13% of all NVG cases, respectively . Mechanistically, CRVO induces hypoxia from venous thrombosis and subsequent decreased retinal perfusion . In PDR, the exact mechanism is not completely understood but vascular and neuronal alterations are thought to result in thickened endothelial basement membranes resulting in vascular damage and subsequent retinal hypoxia . Finally, OIS causes retinal hypoxia in the setting of common or internal carotid atherosclerosis and compromised retinal perfusion. History of significant carotid artery occlusion (> 90%) on the same side with elevated intraocular pressure should raise one's suspicion of OIS-associated NVG. NVG can also be due to chronic retinal detachments, severe ocular inflammation (e.g., chronic uveitis, vasculitis, trauma, endophthalmitis), or intraocular tumors (e.g., choroidal melanoma, retinoblastoma, metastasis). Less common entities that cause retinal ischemia, and subsequently NVG, include central retinal artery occlusion (CRAO), sickle cell retinopathy, radiation retinopathy, retinopathy of prematurity, and carotid-cavernous sinus fistulas [2, 11]. Regardless of the underlying etiology, posterior segment ischemia results in disequilibrium between angiogenic and antiangiogenic factors in the aqueous humor . 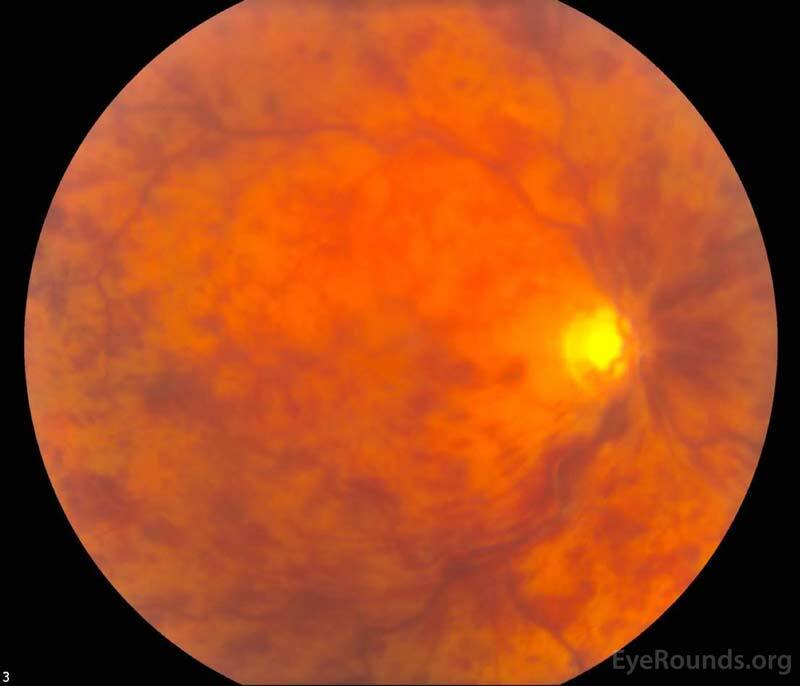 In the setting of retinal hypoxia, there are increased levels of angiogenic factors such as VEGF, insulin growth-1 factor, inflammatory cytokine IL-6, endothelin-1, and nitric oxide [13-17]. VEGF plays a particularly important role in neovascularization as evidenced by high VEGF levels in the anterior chamber of patients with ischemic CRVO and PDR [1, 2, 18]. These new, aberrant vessels are commonly characterized by increased permeability, absence of intercellular junctions, and thin walls. They appear irregularly organized with meandering paths. Additionally, a fibrovascular membrane consisting of proliferating myofibroblasts develops along these vessels, often on the surface of the iris and eventually within the iridocorneal angle. The contractile properties of these myofibroblasts lead to angle closure and/or ectropion uveae (i.e., eversion of the posterior iris surface at the pupillary margin) . As aqueous humor outflow through the trabecular meshwork becomes compromised, NVG develops and glaucomatous ocular damage occurs. Anterior biomicroscopy and gonioscopy are critical in the diagnosis of this entity. The signs and symptoms of NVG vary by stage and are well documented in previously published literature . The clinical course of NVG can be divided into four stages: prerubeosis, preglaucoma, open angle, and angle closure stage . The prerubeosis stage is characterized by the absence of symptoms, normal IOP, and clinical findings consistent with the underlying disorder causing retinal ischemia such as CRVO, PDR, or OIS and is considered a precursor to neovascularization . In the case of CRVO, biomicroscopy reveals tortuosity and engorgement of all branches of the central retinal vein, extensive deep blot and flame-shaped hemorrhages in the peripheral retina and posterior pole (Figure 1), severe disc edema, and disc hyperemia. The preglaucoma stage is described by the absence of symptoms, normal IOP, and NVI in which irregular, fine, tortuous, and non-radial vessels are found on the surface of the pupillary margin. These neovascular bundles appear in a disorganized, meandering arrangement as they grow over the iris stroma and eventually over portions of the angle in the anterior chamber . Several conditions with engorged iris vessels can simulate NVG, including anterior uveitis, vascular tufts of the pupillary margin, and retinopathy of prematurity . In patients with ischemic CRVO, NVI occurs in 49% of affected eyes within the first six months (i.e., 100-day glaucoma), and anterior segment neovascularization is much more common than posterior segment neovascularization . One should remember, however, that one-third of the eyes with NVI and about one-quarter of the eyes with both NVI and NVA never develop NVG . The open angle stage is characterized by prominent NVI, NVA, and fibrovascular membranes that block the trabecular meshwork and acutely increase IOP leading to glaucomatous optic neuropathy in the setting of an open angle. This stage is associated with a reddish discoloration of the TM, inflammation, and anterior chamber hemorrhage . The differential diagnosis also includes ocular disorders with associated iris or angle vessel variants that may mimic true neovascularization, such as Fuchs' heterochromic iridocyclitis, essential iris atrophy, and pseudoexfoliation syndrome . The angle closure stage is defined as peripheral anterior synechiae causing remarkably high IOP (> 60 mmHg) and results in ocular pain, headaches, nausea, vomiting, photophobia, and vision loss. Other clinical findings may include an RAPD, hyphema (Figure 5), conjunctival congestion, and an edematous cornea that may also contribute to vision loss . In determining the cause of NVG, intravenous fluorescein angiography is a helpful test that may reveal delayed arterial filling and fluorescein leakage consistent with CVRO (Figure 2) . The multicenter CRVO study demonstrated that an eye is at high risk for neovascularization if there are >75 disc diameters of capillary non-perfusion; thus, smaller areas of non-perfusion seen on fluorescein angiography are not high risk for NVG development if vision, fields, pupils, ERG, and other morphological tests are normal [2, 3]. Optical coherence tomography is a non-invasive imaging test that detects CME and retinal changes associated with NVG or the underlying etiology (Figure 4). 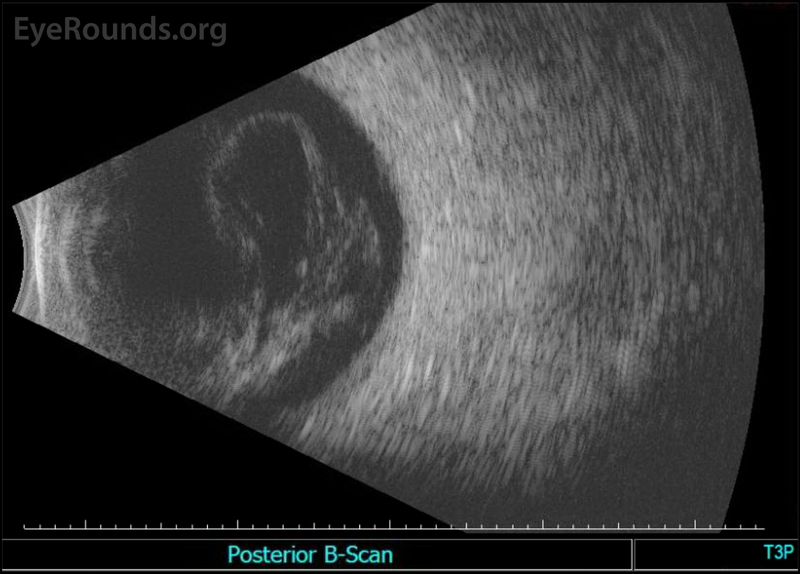 B-scan ultrasound is useful when visualization of intraocular structures is challenging and can be used to obtain important information on the status of the lens, vitreous, retina, and other structures (Figure 6). Gonioscopy is an excellent tool for monitoring NVA and early synechiae formation (Video 1). The fibrovascular membranes and abnormal blood vessels do not extend beyond Schwalbe line in NVG; however, they do characteristically pass over the trabecular meshwork and then branch. Because NVA may be present without the presence of NVI, gonioscopy is imperative even if no neovascularization is seen on slit lamp examination. Several gonioscopy videos demonstrating NVG exam findings can be viewed at gonioscopy.org. Other testing (e.g., electroretinography) to diagnose the underlying CRVO, PDR, or OIS are important but are beyond the scope of this article. Video 1. Gonioscopy in a patient with advanced NVG. Prominent NVI can be seen extending from the pupillary margin to the angle in a non-radial pattern. These vessels extend to the trabecular meshwork but do not extend to Schwalbe line. Although not visualized, it is evident that a fibrovascular membrane is associated with the neovascularization given the 360 degrees of ectropion uveae with an excellent view of the ciliary processes. A filtering device (Ahmed valve) is seen superiorly. This represents a different patient than the above case. Gonioscopy was performed by Dr. Wallace L.M. Alward, and this video is used with his permission. Modifiable risk factors include uncontrolled diabetes, systemic hypertension, vascular disease, and POAG . Non-modifiable risk factors include age and male gender . Visual acuity is the most accurate predictor of NVG risk after CRVO . The amount of non-perfused retina and peripheral retinal hemorrhages are directly associated with development of NVG in ischemic CRVO [4, 11]; however, all functional and morphologic testing should be considered together when assessing prognosis and risks . Intraocular surgery such as cataract extraction increases the risk for anterior segment neovascularization as VEGF is thought to move easier into the anterior chamber in a pseudophakic eye and, especially, in an aphakic eye. Any co-morbidity that decreases systemic oxygenation (e.g., obstructive sleep apnea, nocturnal arterial hypotension) would further exacerbate any underlying retinal ischemic process [22, 23]. Patients who have POAG are also at increased risk of developing NVG . The major complication of anterior chamber neovascularization is synechial angle closure resulting in persistently elevated IOP and intraocular glaucomatous damage. Laser peripheral iridotomy is not helpful for synechial ACG. Hyphema, or pooling of blood in the anterior chamber, is commonly associated with NVI given the fragility of these abnormal blood vessels. Persistent hyphemas often result in decreased vision, elevated IOP, and/or long-term corneal blood staining. Other complications of NVG include VH (Figure 6), retinal detachment, and hypotony. For patients with ischemic CRVO and other patients at high risk for developing NVG, it is recommended to see these patients at least every 2-3 months within the first 7-8 months to monitor for NVG development . If NVG is diagnosed, the medical treatment is aimed at reducing IOP. Common medications include agents that decrease aqueous humor production . Corticosteroids have been shown to lower IOP by increasing aqueous humor outflow in patients with NVG secondary to ocular inflammation . Prostaglandin analogs should be avoided to prevent further breakdown of the blood-aqueous barrier . Pilocarpine and anticholinergics are also avoided as these medications have been shown to increase inflammation, cause miosis, worsen synechial angle closure, and decrease uveoscleral outflow . PRP aims to reduce further neovascularization and should be considered in cases of retinal ischemia-induced NVG, especially in the setting of PDR . PRP reduces the overall oxygen demand of the retina. Thus, the remaining retinal tissue receives sufficient oxygen, which subsequently reduces VEGF and stabilizes the disequilibrium between angiogenic and antiangiogenic factors. In the CVOS, the authors reported regression of anterior segment neovascularization in response to PRP but found no apparent benefit in performing PRP before the development of NVI or NVA . As recommended by Hayreh, et al., PRP should be performed when the risk of NVG development and/or progression is high enough to justify the markedly decreased peripheral visual fields these patients experience . PRP alone may not be effective in preventing NVG in ischemic CRVO and OIS [2, 26]. It takes approximately four weeks for PRP to show regression of anterior segment neovascularization, and it has been determined that PRP alone is inferior to the combination of PRP and intravitreal bevacizumab when comparing NVI/NVA regression rates and the number of patients with complete NV regression (17% vs. 100%) . In the setting of OIS, surgical carotid endarterectomy may be indicated to resolve the underlying cause for retinal ischemia . Similar to PRP, VEGF inhibitors such as bevacizumab target the primary pathway of neovascularization triggered by VEGF. Historically, the efficacy of anti-VEGF as an adjunct treatment for NVG has been challenged . In a recent systematic review and meta-analysis, Zhou M, et al. reported the use of intravitreal bevacizumab injection (IVB) pretreatment in NVG to be a safe and effective additional step during Ahmed glaucoma valve implantation . The authors found that pretreatment with IVB lead to significantly greater complete success rates and lower frequency of post-operative hyphema . Trabeculectomy is often considered for the definitive lowering of IOP in glaucoma. Although adjunct treatment with antimetabolites such as 5-fluorouracil (5-FU) and mitomycin C (MM-C) reduces overall failure rates, trabeculectomy is not as effective in NVG as compared to other types of glaucoma and results in higher rates of hyphema [31, 32]. Trabeculectomy offers the advantage of achieving lower post-operative IOP compared to shunts but is undesirable in the presence of florid neovascularization, which often results in bleb failure through conjunctival scarring at the filtration site. Glaucoma drainage devices are also used for definitive lowering of IOP in glaucoma. Shen, et al. reported slightly superior outcomes with drainage devices compared to trabeculectomy with adjunct antimetabolites . Aqueous shunts (e.g., Ahmed shunt) provide the advantage of avoiding a surgical iridectomy and are more likely to tolerate perioperative bleeding and massive fibrin reaction. Surgeons may opt to place the tube in the sulcus behind the iris in an attempt to protect the tube from NVG-associated fibrovascular membranes and to protect the cornea. In the setting of active hyphema and inflammation, an aqueous shunt is recommended. Immediate IOP control and subsequently better visual results have made the Ahmed valve glaucoma drainage device the implant of choice for NVG . For non-clearing or recurrent VH, pars plana vitrectomy with intraoperative endolaser should be considered. Interestingly, studies have shown that a vitrectomy elevates oxygen tension for many months and, thus, decreases the risk of future neovascularization . Anti-VEGF injections with or without PRP should be performed prior to any intraocular surgery in the setting of NVG. If there are significant media opacities that preclude PRP treatment, then vitrectomy, cataract extraction, or a combination procedure should be considered to ensure adequate laser can be performed in a timely manner. Cycloablative diode therapy (e.g., CPC) may ultimately be necessary if filtering procedures, injections, and laser are unsuccessful in halting NVG progression. Palma C, Kim D, Singh A, Singh A. Neovascular Glaucoma. In: Shaarawy T, Sherwood M, Hitchings R, Crowston J, editors. Glaucoma Medical Diagnosis and Therapy. 2nd Edition ed; 2015; p. 425-433. Kincaid MC. Pathology of diabetes mellitus. In: Tasman W, Jaeger EA, editors. Duane's Foundations of Clinical Ophthalmology. Philadelphia: Lippincott-Raven; 1996; chapter 18; p. 1-14.